It’s the first day of school at Marshall Elementary School, and Principal Peter Avila has been hugging, highfiving and tousling his way across the blacktop all morning, welcoming students and parents in English and Spanish. “What’s going on, my man? Did you have a good summer?” Avila asks, slapping hands with one returning student, a confiscated Nerf football tucked under his arm. 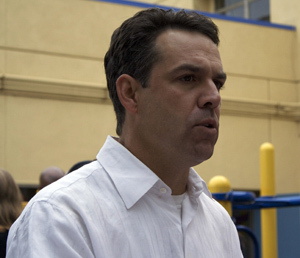 To the surprise of many new parents, Avila flourishes his business card—which includes a cell phone number—as he welcomes them to the school. It’s this kind of engagement, parents say, that attracted them to Marshall in the first place. That and the trend of generally improving test scores that makes Marshall the second-highest-ranked school in the Mission District. It’s Academic Performance Index (API) score was 702, compared to 855 for Moscone, out of a possible score of 1,000. The scores range 116 to 946 citywide. She also chose Marshall for its two-way Spanish immersion program—which is 88% Spanish/12% English in kindergarten and 50/50 by fifth grade—that is now offered in every classroom. And on the first day of school, everyone speaks a mix of Spanish and English. “Stay here, quédate aquí,” says Laura Sánchez to her 9-year-old Aldo, who’s entering fourth grade. He was born in the United States but his mother is from Mexico, and Sanchez said she’s always wanted her children to have a bilingual education. Aldo prefers math at school, but wants to be a police officer when he grows up. 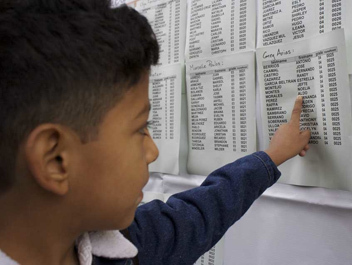 “I have to look at the list of students to see who my teacher is,” he says in Spanish, taking a reporter’s hand and going to the class lists posted on the wall outside the school. Avila, 42, who taught for 10 years in East Oakland and is in his second year as principal at Marshall, says he hopes to smooth test scores, which dropped slightly last year, to a steady ascent. Already, state budget cuts have meant that Marshall has had to scale back the length of its Marine Headlands overnight trips for third, fourth and fifth graders. The school’s growing success has also been attributed to its 15-year-old tutoring program, Mission Graduates. It works to encourage students even at the elementary school to attend—and finish—college. Ariyo Salazar, who served as program director for the last five years and now directs the new Parent Partner Program, says that this year they have spots for 120 of Marshall’s 240 students, 76 percent of whom are Latino, and 89 percent of whom are socioeconomically disadvantaged. The program, taught in English, focuses on vocabulary and reading comprehension, which Salazar describes as the keys for unlocking skills in math and science. The problem, parents say, is that there are not enough spaces in the after-school program. “It’s tough for the parents. It can be a challenge for them to find a safe place for the kids to go,” says Rebecca Carillo, the 23-year-old director of the after-school program. As classes begin Monday morning, Avila watches as a parade of kindergartners get a hallway tour in Spanish. The teacher stops in front of the girls’ bathroom, explaining that it’s not for niños. They pause to say hi to Avila. PreviousSchool Started, Why All the Smiles? Vanessa loves reporting for Mission Loc@l because of the many ways it deepens her connection to the Mission District, which she has called home for the past four years.